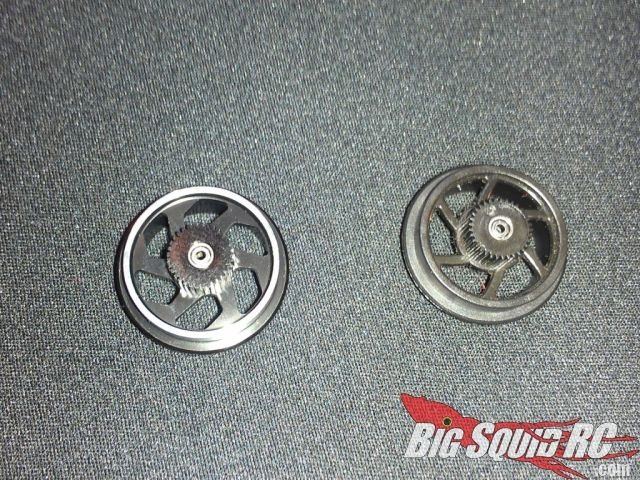 Atomic Aluminum Wheels for the Kyosho Mini-z Moto – Review « Big Squid RC – RC Car and Truck News, Reviews, Videos, and More! I received a set of Atomic’s new wheels for the Mini-Z Moto. I hadn’t put much thought around it but I realized that these are in fact aluminum wheels while the stock Mini-z Moto wheels are cast out of a heavier metal. On a Mini-Z, switching to an aluminum wheel you rarely end up saving weight. Would the weight savings translate to lower rotational mass and quicker acceleration? Would a motorcycle’s handling greatly be impacted by lower the weight of the wheels? Let’s find out! I was immediately impressed by the aluminum and black color scheme. 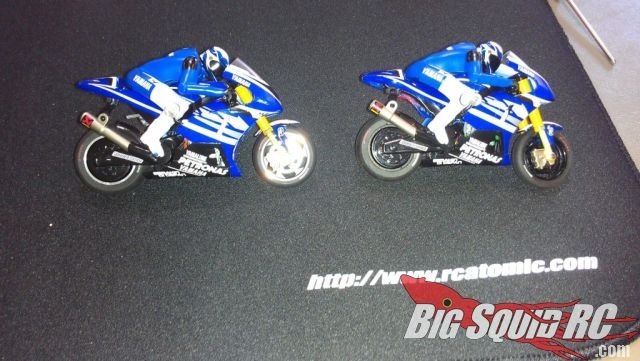 The wheels look sharp on their own and just as sharp on the bike. Given the design of the wheel you do give up a little in scale looks but I like the fact I’m looking at a machined part. With my Mini-Z cars, I know I’m not saving weight with aluminum parts but I really do admire the engineering and finish of the parts. I feel the same way about these wheels plus the rare bonus that I am in fact, saving weight. Installation – I need to be clear on the two parts to this process. The bike design and the wheel build quality. As far as the wheel’s build quality, these were a perfect fit. I need to make that clear because the process I’m about to describe is in no part frustrating due to the Atomic wheels. The front wheel is easiest if you consider removing and reinstalling the world’s smallest e-clip something “easy” to do. The axle pin fit perfectly in the new wheels and there was no slop or tight fittings. An unscientific spin test seemed to show the new wheel spun longer than the original. I can’t say for sure if it was due to new bearings being included with the wheel or higher quality bearings. In my mind if the lighter wheel spins longer there must be a major improvement as I would expect the heavier wheel’s mass to spin a little longer. The rear wheel was not easy in any way. Again, when it came time to fitting the Atomic wheel, it was a perfect fit. This is important as the drivetrain of the motorcycle incorporates a drive gear on the wheel hub itself. The gears are of course small so fit and tolerances are critical. The wheel was a perfect fit. HOWEVER, the installation is not something I would want to repeat. Granted it was the first time I’ve done this but I would put the frustration level somewhere between a Mini-Z diff rebuild and a potentiometer cleaning. Time saving tips would include the removal of the muffler even though it swivels away. Also, practice reinstalling the covers for the rear end (without bothering with the shims) so you understand how the bike goes back together. This way, when the balancing act of getting the brushless hub into the rear wheel, the 2 shims on the outside of the wheel’s axle, and inserted into the drivetrain side of the rear end, you won’t be fiddling with how to slide all the parts together. 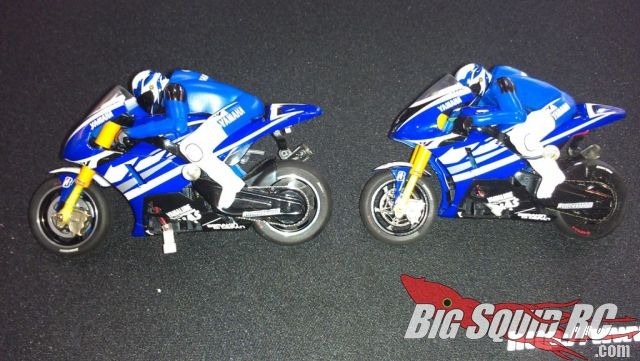 Performance – I would have to have two bikes side to side to know for sure but it did appear the bike with new wheels accelerated a little quicker. The bike felt a little more nimble when throwing it from side to side. Will this make the bikes race worth it on RCP now? They help but I wouldn’t say they are a miracle cure. You’ll enjoy running the bike on the track solo but I’d say the bikes are still a showpiece on RCP track. Still, at the highest speed gyro setting the bike would lean down faster. Holding curves and sweeps on carpet and RCP track where just as reliable. Drifting on tile still works and continues to produce grins! I can’t say my lap times on RCP have improved but it is clear these wheels drive differently and it’ll take some time again to get used to it. It does appear the trickiest part of RCP (going from a sharp turn into another sharp turn in the opposite direction) will be easier and you won’t need to dial back the gyro and stability to pull it off. 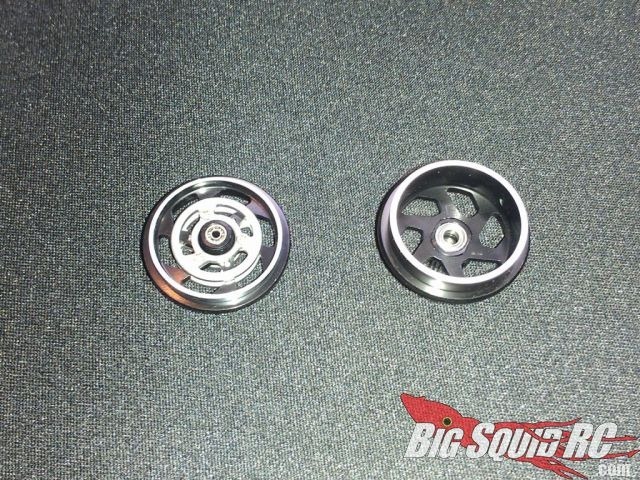 Overall, you are getting a nice set of machined wheels that look sharp on the bike and make it more nimble without sacrificing the stability by turning down the gyro. The build quality is great and I would say this is another win from the Atomic line of Mini-Z upgrades.